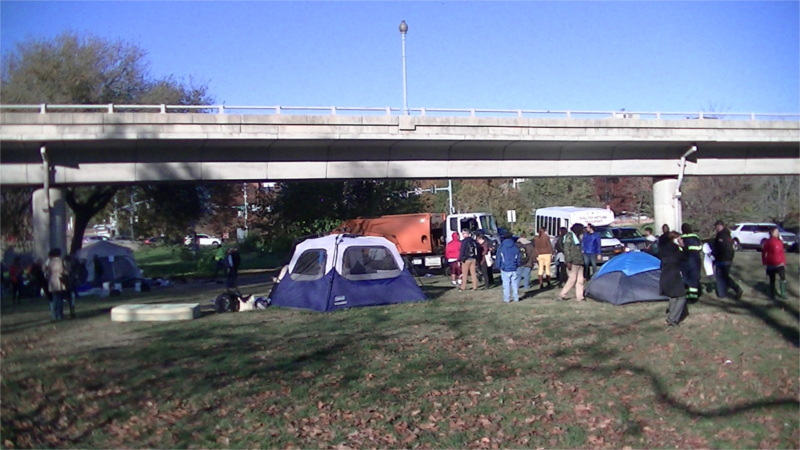 On the 20th of November, Mayor Bowser carried out her threat to begin DPW "cleanup" raids on homeless camps with an attack on the camp in Rock Creek Park near Va Ave. A trash truck, a box truck, and a shelter van were brought in, along with at least one police van for security. Recent Dept of Justice opinions opposing prosecution of the homeless may have deterred forcible removal, but it was clear that some belongings other than the tents were either being thrown in the trash or hauled away to a government warehouse. As of 7PM, many tents were still standing, and it appeared that most residents had refused the Mayor's demands to move to city-controlled shelters. The shelters are known for everything from metal detectors to bedbugs, and some refuse to use them. 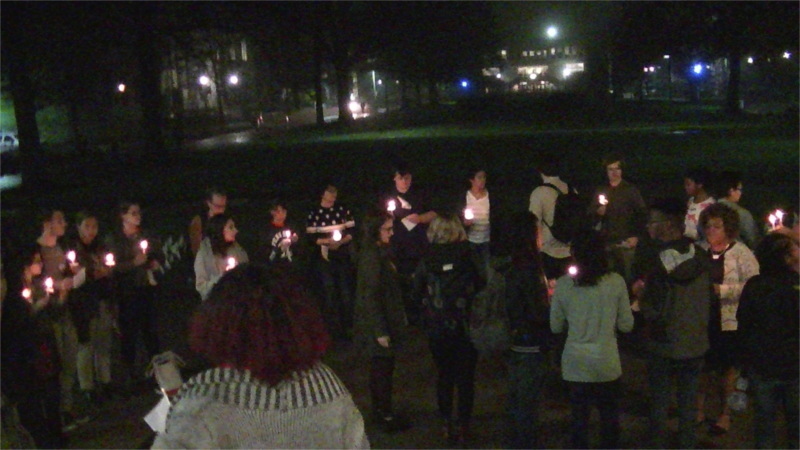 On the evening of November 19th the Queers and Allies' Trans and Non-Binary Collective at American University held the Trans Day of Remembrance Vigil and Speakout. After speakers at the indoor portion spoke of the severe discrimination, poverty, and widespread murder and police violence faced by transgender people, everyone went outside for a vigil to remember those who have been killed. Flags of remembrance for the fallen were planted in the quad while the whole group held candles in the dark. On the 18th of October, Trans Week of Action protesters took to the streets for the second night in a row. 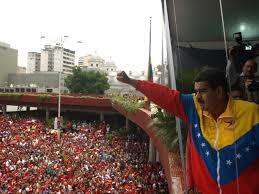 This time around, the blockades targeted the area around Target. Police tried to aggressively move traffic past protesters. When protesters stood their ground, one cop responded first with pushing, then with a violent takedown and arrest of an activist perceived as an organizer. 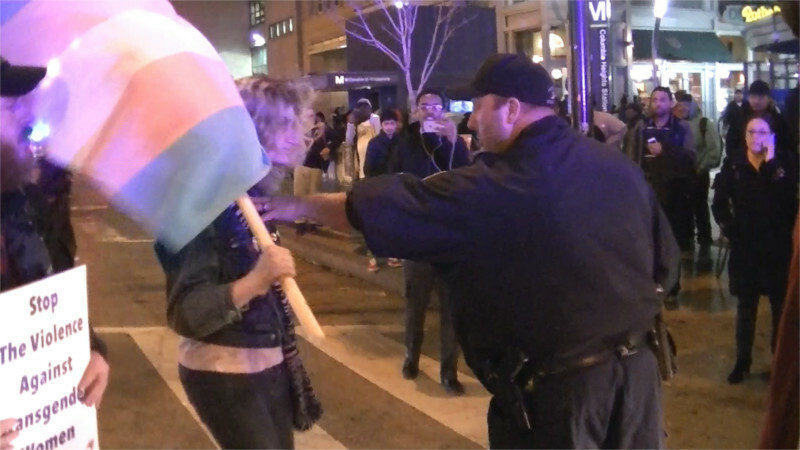 Arrest can be a life-threatening experience for any transgender person, so the rest of the protesters were severely agitated by this, ultimately responding by retaking the exact same intersection. 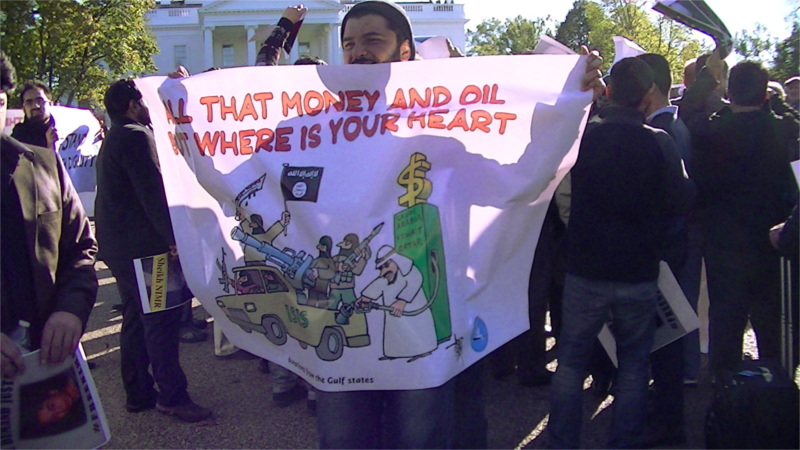 On the 17th of November,protesters against the TPP trade deal marched to the embassies of many countries affected by the treaty.At the Embassy of the Phillipines, protesters burned a symbolic "TPP text" much smaller than the 6,000 page stack in solidarity with protesters in the Phillipines who burned ASEAN logos. At the Embassy of Japan, one protester locked himself by the neck to the doors. It took about an hour for police to remove and arrest him. 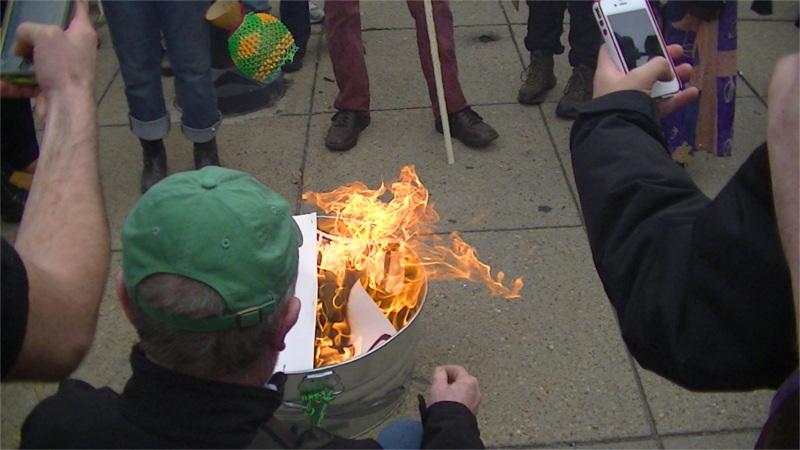 Burning a stand-in for the TPP at the Phillipine Embassy, the 6000+ page full text would require a furnace to incinerate. 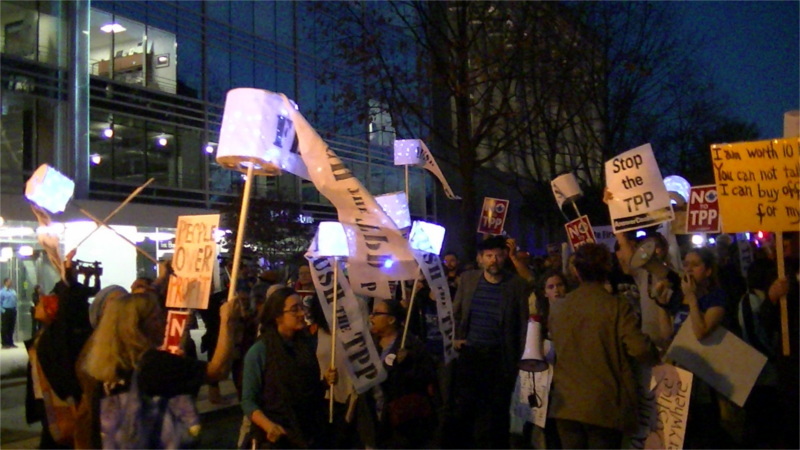 On the evening of November 16, anti-TPP protesters assembled at the US Chamber of Commerce for a "torchlight" themed parade. The "torches" were toilet roll shades lit from the inside by LED lights. This march stormed the building housing investment banker Morgan Stanley's offices. Next marchers blocked access to Monsanto after a failed attempt to get inside. Finally the march went to the Ronald Reagan building and largely took over the plaza in front of it on the 14th st side. 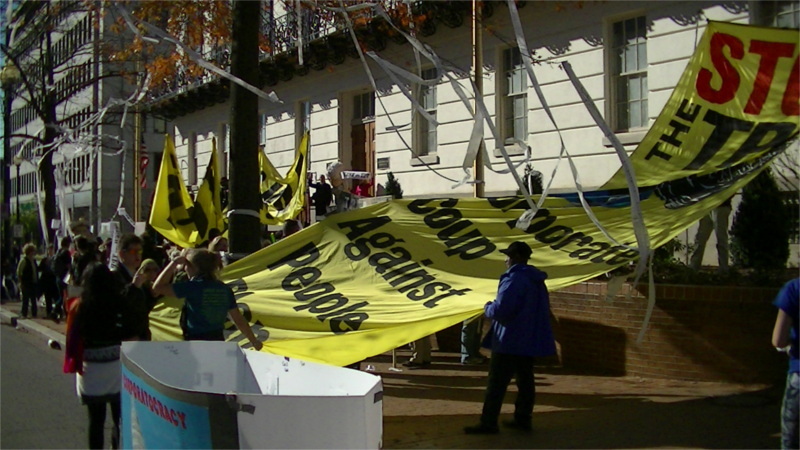 On the 16th of November, opponents of the Trans-Pacific Partnershio (TPP) marched on the offices of the United States Trade Representative(USTR), blocked entrances for a while, and festooned the area with anti-TPP toilet paper. This sort of thing just had to happen sooner or later-TP'ing the TPP. As a "night action" it would have been a potent enough symbol, but this was done in the open while activists controlled both the sidewalk and that half of the street. Skanska is a massive multinational construction company that is building a new animal "research" lab for University of Washington. 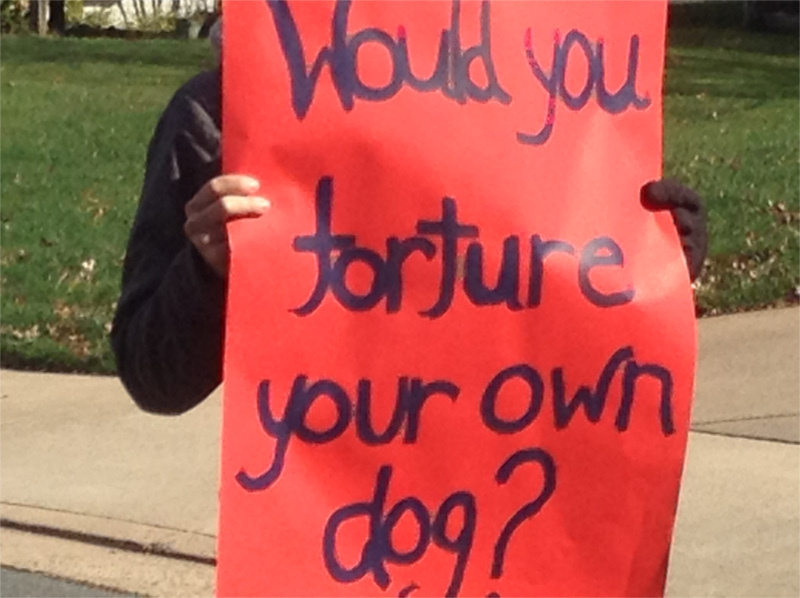 On the morning of Saturday, November 14, activists from the No New Animal Lab campaign showed up at the Stanton, Va home of Stephen Skinner, Executive VP and General Manager of Skanska’s DC office. Grumpy neighbors responded with angry counter-chants while calling the cops and even trying to directly disrupt the protest. Stephen Skinner was caught at home, stepping outside only long enough to stick his "no tresspassing" sign in the lawn. The Shortwave Report 11/13/15 Listen Globally! Read more about The Shortwave Report 11/13/15 Listen Globally! 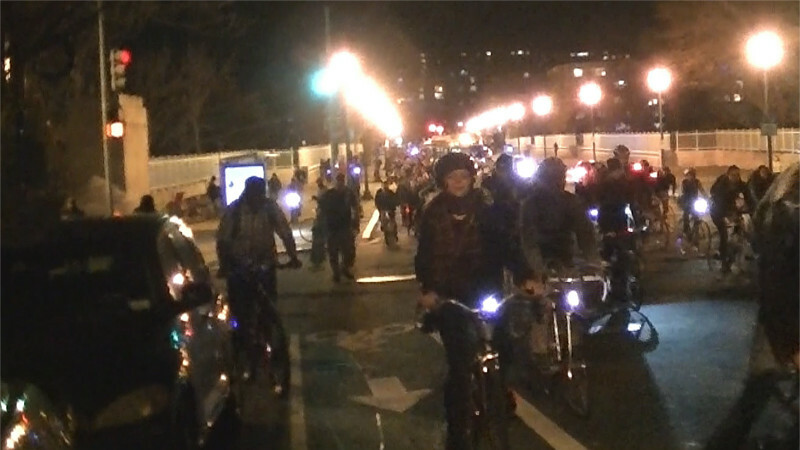 On the 11th of November, the DC Bike Party once again took to the streets. This ride went up the hills and around Adams-Morgan and 16th st, with a mid-ride stop in Malcolm X Park. Near the end of the ride came a display of precision riding as several riders "rode under the arch" formed by the joined hands of two other riders.